Tea bags were invented in America in the early 1800s, and were initially used to hold samples of teas brought from India. Today, an estimated 96% of all cups of tea served around the world are made using tea bags. After tourism, the cultivation of tea is India’s second largest industry. Tea leaves are a natural deterrent against insects such as mosquitoes. Simply use slightly damp leaves to add the scent of tea to the areas you want to keep insect-free. Tea leaves can also help to heal shaving cuts, eliminate bad odors, and make a great fertilizer for roses. As we all know, tea is a natural antioxidant, but it is also rich in essential vitamins and minerals such as vitamins B2, B1 and B6, potassium, manganese, folic acid and calcium. And of course Rae’s tea products are also enhanced with Organo Gold’s prized Ganoderma powder, making Rae’s teas some of the most beneficial beverages around! It’s been a little over a year since the introduction of the delicious BrewKups at P50K in San Antonio, Texas. 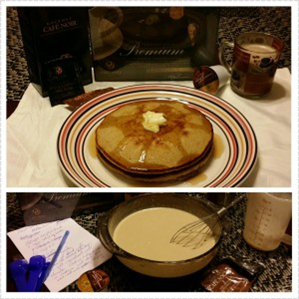 To celebrate the “occasion”, I want to share with you one of my favorite recipes from the OG Cookbook: OG Brewed Mocha Almond Pancake by Roberto Carlos Cruz from Puerto Rico. Brew Organo Gold Chocolate Almond BrewKup using the medium size. Dissolve OG Café Mocha and OG Black Coffee into the brewed Chocolate Almond. Set aside. In a large bowl, combine flour, beaten eggs, oil and milk and whisk until well incorporated. Add Organo Gold brewed coffees and chocolate to the mixture. Blend well. Cook pancakes on a hot griddle or pan over medium heat. Turn once and cook until they are golden. To serve, add a small scoop of butter and drizzle with honey. FINALLY! It’s staying warm outside on a consistent basis and I really wanted some iced green tea. 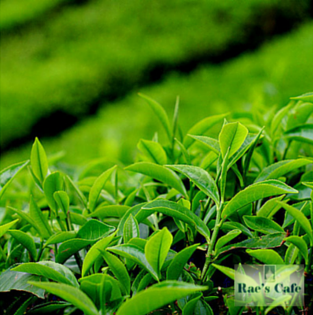 What better way to enjoy it than with the Organic Green Tea featured at Rae’s Cafe. 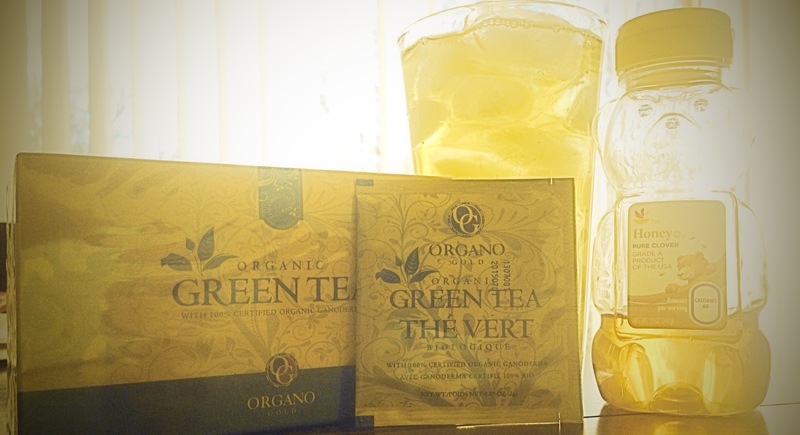 The organic Ganoderma supplements the benefits of the green tea for an even healthier drink! Green tea has been used as a medicine for thousands of years, originating in China but widely used throughout Asia this beverage has a multitude of uses from lowering blood pressure to preventing cancer. The reason that green tea has more health benefits attached to it than black tea is due to the processing. Black tea is processed in a way that allows for fermentation whereas green tea’s processing avoids the fermentation process. As a result, green tea retains maximum amount of antioxidants and polyphenols the substances that give green tea its many benefits! While you’re waiting for water to boil, open Green Tea sachets and place in mug; pour desired amount of honey over tea bags, if desired. Pour boiling water over bags to top of mug (honey will melt easily). Steep for 1-3 minutes (depending on taste preference) then squeeze excess liquid out of bags and discard them; stir tea. Cool the tea in the fridge for 15-20 min. Pour tea over desired amount of ice and enjoy! Since its arrival, Jamaican Blue Mountain Royal Brewed Coffee has been one of Rae’s most exclusive products. Now, for a limited time only, this rare brew is available as a BrewKup so you can enjoy a taste of Jamaica’s finest coffee like never before! But what is Jamaican Blue Mountain coffee? And why is it one of the most sought after coffee in the world? For starters, Jamaican Blue Mountain coffee is only harvested once a year, making it an extremely rare and scarce brew. Additionally, the Blue Mountain region of Jamaica is well known for its unmatched combination of climate and soil making it a renowned harvesting environment for coffee beans. At Rae’s Cafe, we combine this exclusive coffee with Certified Organic Ganoderma spore powder to produce a coffee that is truly fit for royalty! This Green Tea Hot Cocoa will surprise and delight you. The addition of green tea makes this a truly revitalizing beverage and turns this ordinary cocoa into a health-boosting drink everyone will enjoy! I like to boil the water seperately and steep the tea for 1-3 minutes. While that’s working, I heat up the milk and stir in the half of a hot chocolate sachet and save the rest for another cup. After the tea is ready, just pour the hot chocolate in, stir and enjoy!